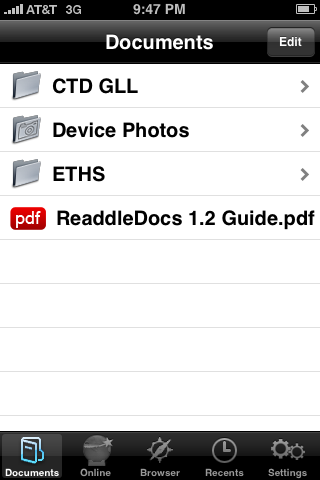 ReaddleDocs, a “complete document and file management solution for your iPhone and iPod touch,” has been updated to version 1.6. Version 1.6 adds a PDF viewer to the app. The PDF viewer allows for full text document search as well as the ability to view password protected documents, navigate through embedded PDF bookmarks and open large PDF files. Check out David’s full review of ReaddleDocs HERE. ReaddleDocs, a document and file management solutions, is on sale for half price ($4.99) until Sunday, May 17th. David did a review of ReaddleDocs about a month ago (check it out HERE) and was comfortable recommending it at the $9.99 price range so, you will definitely want to check it out now that it is $4.99. The developer has also said that they have submitted an update to Apple that contains “significant improvements and new features.” So, get it now while it is half price and reap the benefits of the update when it comes out!